the barefoot lounge blends ancient eastern reflexology and accupressure to address and relieve modern stress and tension. It's beneficial for the whole body as well as your feet! 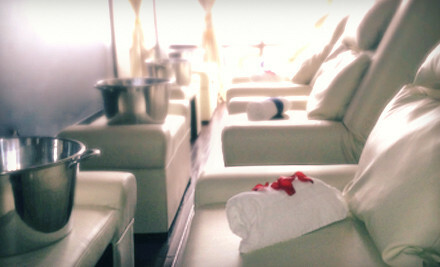 barefoot services are designed for therapeutic and relaxation purposes without the need to undress. This remarkable ancient healing art stimulates pressure points and activates a natural healing process for total body stress relief and a tangible sense of well-being. Lie back and feel the weight of your body sink into our plush foot sofas with each exhalation. Then we perform a dance of strokes, thumb-walking, and pressure points to explore and balance the reflex map of your hardworking, little appreciated, sometimes neglected, wonderous and divine feet and hands. Let your feet splash in a warm foot soak and the relaxation begins. Bring a group of friends or a loved one for a treat you can enjoy together in the same room. Third Party Coupons/Vouchers are subject to availability and are valid Monday- Thursday. Limit 1 per client.